The SETI Institute belives that planetary systems orbiting red dwarfs — dim, long-lived stars that are on average billions of years older than our sun — are worth investigating for signs of advanced extraterrestrial life. 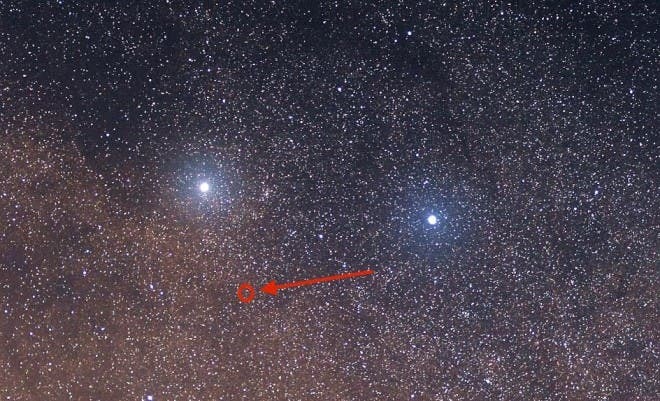 The star that’s closest to our sun, Proxima Centauri, is a red dwarf. A variety of observing efforts, including the University of London’s Pale Red Dot Initiative, are looking for earthlike habitable planets around Proxima Centauri (shown below). “This may be one instance in which older is better,” said astronomer Seth Shostak of California-based SETI, a private, non-profit organization which stands for Search for Extraterrestrial Intelligence. “Older solar systems have had more time to produce intelligent species.” A super-Earth known as Kapteyn b that orbits an 11.5 billion-year-old red dwarf, for example, makes the star and the planet 2.5 times older than Earth. The two-year project involves picking from a list of about 70,000 red dwarfs and scanning 20,000 of the nearest ones, along with the cosmic bodies that circle them using the SETI Institute’s Allen Telescope Array in the High Sierras of northern California, a group of 42 antennas that can observe three stars simultaneously. For a long time, scientists ruled out searching around red dwarfs because habitable zones around the stars are small, and planets orbiting them would be so close that one side would be constantly facing the star, making one side of the planet very hot and the other quite cold and dark. But more recently, scientists have learned that heat could be transported from the light side of the planet to the darker side, and that much of the surface could be amenable to life. “In addition, exoplanet data have suggested that somewhere between one sixth and one half of red dwarf stars have planets in their habitable zones, a percentage comparable to, and possibly greater than, for Sun-like stars,” said the statement. The brightest of Red Dwarfs are a tenth as luminous as the sun, and some are just 0.01 percent as bright, but account for three-quarters of all stars, with 6 percent or more of all red dwarfs having potentially habitable, Earth-sized planets. The image at the top of the page is an rendering of a cold desert on a planet orbiting Proxima Centauri. Our thanks to by Vladimir Romanyuk of Space Engine, a free space simulation program that lets you explore the universe in three dimensions, from planet Earth to the most distant galaxies. Millions of galaxies, trillions of stars, countless planets – all available for exploration. You can land any planet, moon or asteroid and watch alien landscapes and celestial phenomena. You can even pilot starships and atmospheric shuttles. Proxima and the other Alpha Centauri stars have loomed large in science fiction: from Robert Heinlein’s “Ophans of the Sky” stories of crews traveling to Proxima to Isaac Asimov’s “Foundation and Earth ” set around Alpha Centauri and more recently to the James Cameron’s movie “Avatar,” also set on the fictional Alpha Centauri planet, Pandora.